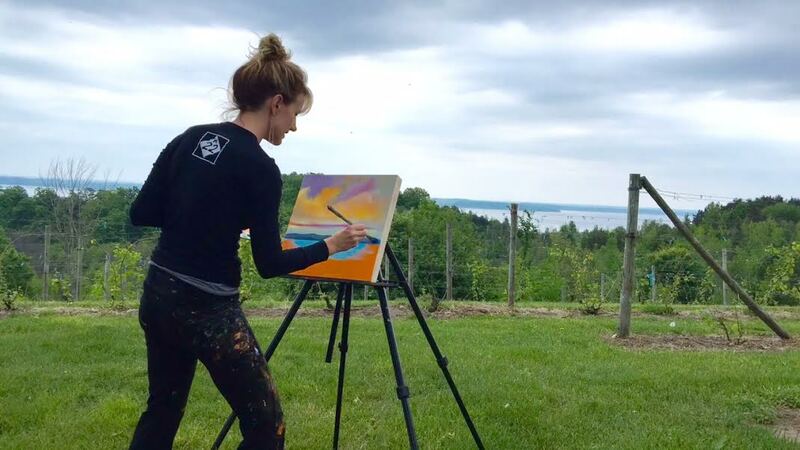 Eventually I tore myself away from Chateau de Leelanau to paint the next breathtaking view, heading off to Good Harbor Vineyards. I met Debbie, Sam and Taylor Simpson several years ago. Debbie and her son, Sam — who is Good Harbor’s winemaker — brought me to one of their properties to talk about art and wine. The rolling vines seemed to go on forever, and the hills and even Lake Michigan peeks out on a clear day. I dreamed of this land, this exact spot, and I longed to paint it. On a warm sunny early summer evening, I did. It was all I hoped for and more. Utterly enchanting. Debbie and her late husband, Bruce, started this winery, one of the first four on the peninsula back in the 1970s. Bruce is a legend up here, having taken many young winemakers and owners under his wing. Along with Larry Mawby, many refer to these two as the “grandfathers” of the region, and all speak of the pair with affection and fondness. They are an impressive team, this brother and sister, and lucky for me, their vineyards are take-your-breath-away beautiful. Debbie is still active at Good Harbor, but looks very much to her talented children in terms of the future. I think I see Debbie on a beach somewhere with her feet up soon, a glass of Chardonnay in her hand, knowing all she and her husband built is in great hands. 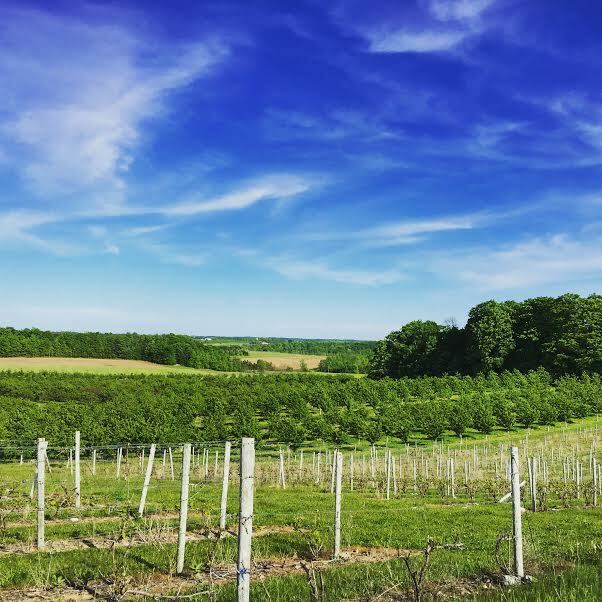 Life “On the Michigan Wine Trail” is sentimental, emotional, exciting and, of course, a visual feast. The people are good, hardworking stewards of this land. 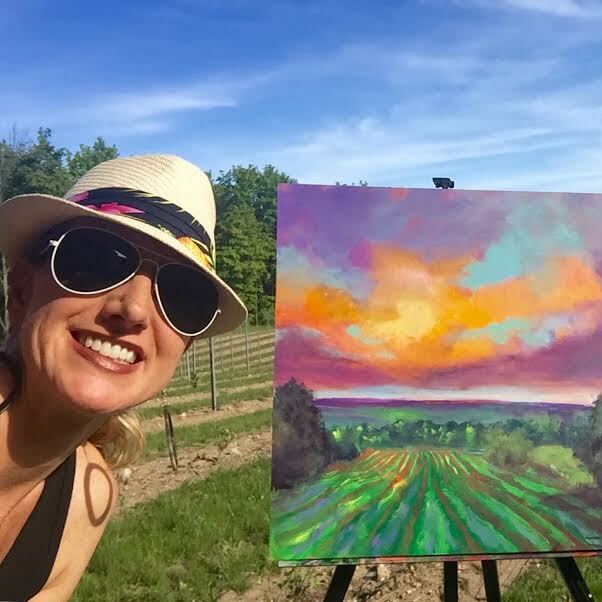 It’s a joy and a pleasure making my way around the wineries of the Leelanau Peninsula Vintners Association and hearing the stories behind this land I paint. It makes all the difference in connecting me to the landscapes as I translate them to canvas and paper. I hope to bring you all along with me and make you just a bit more connected to the land, too. Wine is, after all, a story of that land and these people in a bottle. Uncork it with me on Project 24! 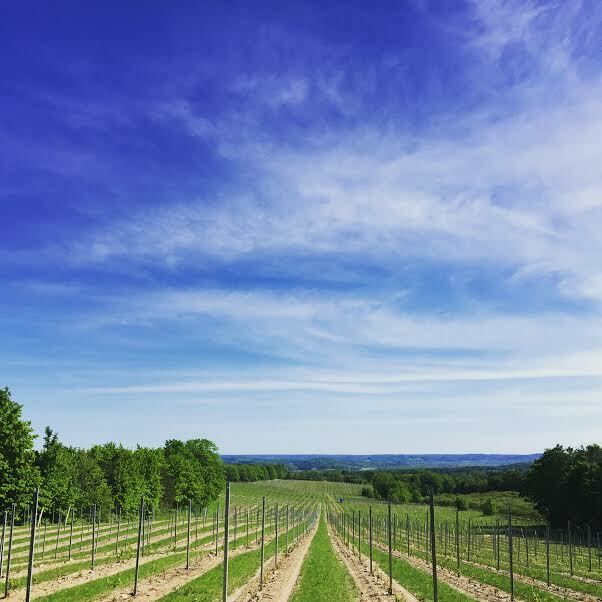 Not far from Forty-Five North, you’ll find Ciccone Vineyards. Tony and Joan Ciccone started planting vines in 1995 — by hand, a true labor of love. These two are passionate about making wine (can you see the trend going on up here? 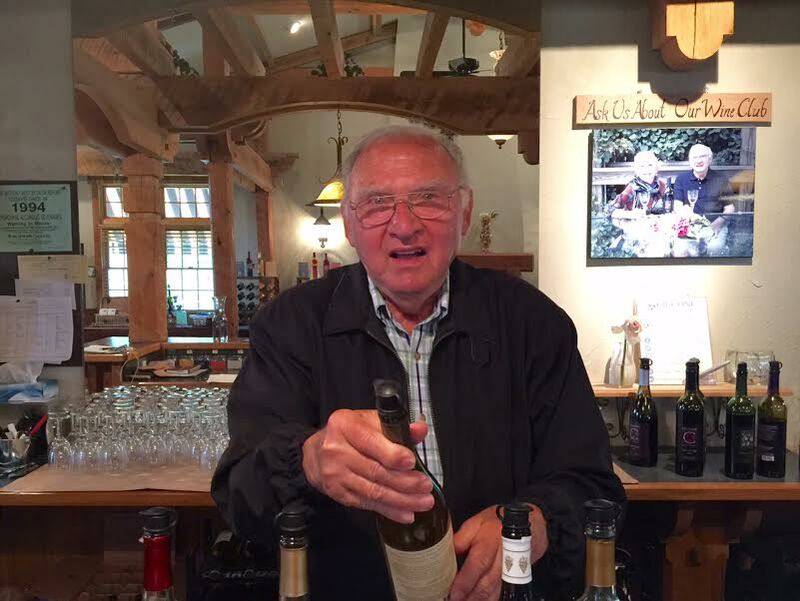 ).Tony says its in his DNA as a son in an Italian family who — like many Italians of that time — made wine in the basement for personal consumption. Tony did so like his father before him. I just hope at 84 I’m still putting the brush to canvas as well as Tony still makes wine. He is training his daughter, Paula, and son, Mario, to take over someday. Paula is the assistant winemaker, and Tony even admits sometimes she knows best — a good sign for the future of Ciccone. 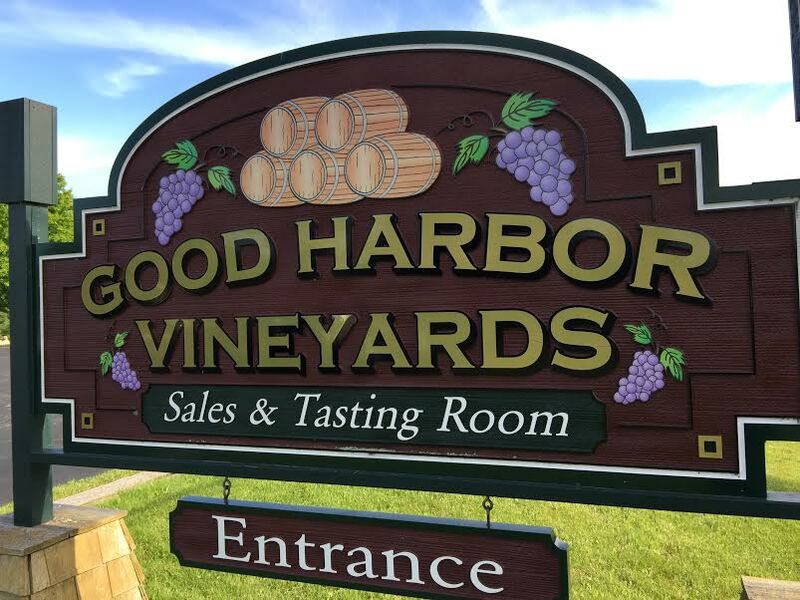 One thing is for sure, tradition and love and history are deeply steeped at this vineyard, like at so many along the trail. I could stay and talk all day, but I do have a job to do, so I reluctantly leave Tony and Joan to their work. 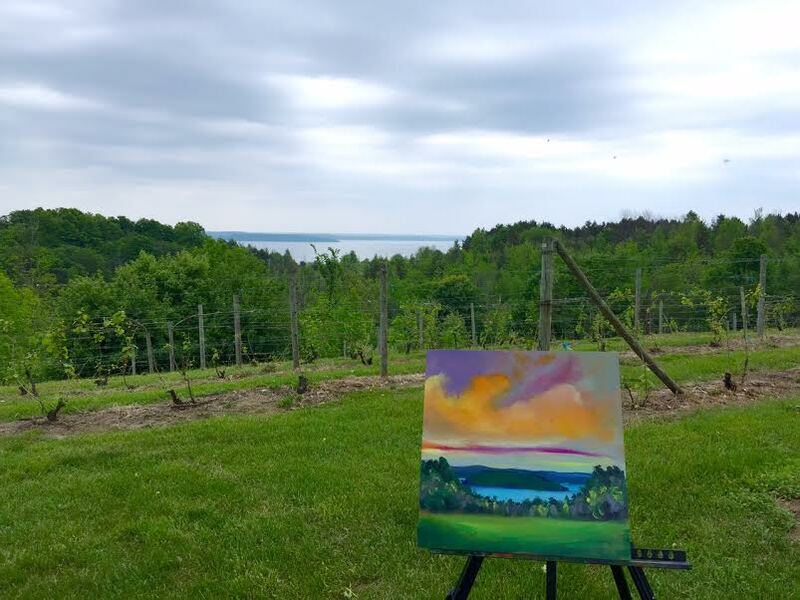 While I explore the property looking for a place to paint, I could have chosen many spots, but when the view of East Grand Traverse Bay — vines in the foreground, Power Island in the background — unfolded before me, up went my easel. I would have stayed into the night had the rains not come. The view was so lovely, I even painted through the drizzle until the rain began to wash away my painting and, with a sigh, I called it a day! Stay tuned for more adventures from Project 24!